What does ‪Michael Phelps' fiancee, Nicole Johnson and Casa Pacifica have in common? 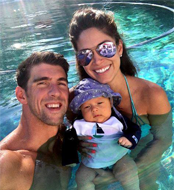 What does ‪Michael Phelps’ fiancee, Nicole Johnson and Casa Pacifica have in common? A dedication to help at-risk kids! As Miss California USA, Nicole worked with our Camarillo, CA based Casa Pacifica Centers for Children and Families, assisting us in our mission to service children who have faced abuse and neglect. Nicole has continued her service to children as she serves as the volunteer marketing manager for the ‪Michael Phelps Foundation, which provides swimming lessons to kids from underprivileged backgrounds.